Inventory We are a resale marketplace, not a box office or venue. Ticket prices may exceed face value. This site is not owned by Tacoma Dome . 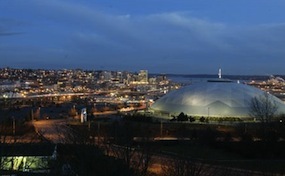 The Tacoma Dome hosted the Seattle SuperSonics from 1994-1995 while the Seattle Center Coliseum was being renovated into the venue now known as KeyArena as well as various regular season Sonics games during other seasons. It also hosted the Tacoma Rockets Western Hockey League team from 1991 to 1995, the Tacoma Sabercats of the West Coast Hockey League from 1997 to 2002, The Tacoma Stars indoor soccer team of the MISL from 1984 to 1992, gymnastics events during the 1990 Goodwill Games, numerous other minor league ice hockey and indoor soccer teams, and many concerts as well. It additionally hosts wrestling events, such as WCW Spring Stampede 1999. Since then the Tacoma Dome has become a fan favorite for many musical guests and recently has announced that Taylor Swift is coming to town. TacomaTicketOffice.com.com is not affiliated with any primary box office or supplier. We are a privately owned and operated business specializing in sales in the secondary market. To buy tickets for any Tacoma Dome events in Tacoma simply click on the event of interest or call our operators at anytime.